Part of the new-look LifeBuilder series, these 12 sessions for individuals or groups unpack the Biblical calling for pursuing justice. God is loving and powerful. He is able to work against some of the strongest forces of hate in the world. You can imitate God's justice by fighting against these same powers in your own life and in the lives of those around you. Taking a fresh look at this theme throughout Scripture, Bob and Carol Hunter challenge you to love justice as God does. And they show you how to work for justice in your everyday life. This revised LifeBuilder Bible Study features additional questions for starting group discussions and for meeting God in personal reflection, together with expanded leader's notes and a "Now or Later" section in each study. 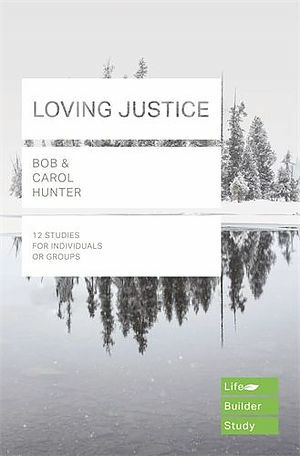 Lifebuilder Bible Study: Loving Justice by Bob Hunter, Carol Hunter was published by IVP in May 2018 and is our 10766th best seller. The ISBN for Lifebuilder Bible Study: Loving Justice is 9781783596928. Be the first to review Lifebuilder Bible Study: Loving Justice! Got a question? No problem! Just click here to ask us about Lifebuilder Bible Study: Loving Justice.